After reading my post yesterday about, among other things, the offal challenge on Top Chef, someone emailed me expressing surprise that I was not a vegetarian. I have been asked before by readers of this blog whether I was a vegetarian. I'm not, but let me qualify that. I am not a vegetarian simply because I do enjoy some forms of meat. However, I find that the older I get the less I seem to crave meat. When I was in my teens and 20s I felt deprived when some form of meat or fish wasn't the centerpiece of a meal, but nowadays I think that more than half the meals I eat don't have either of those. Overall I think I am about 75% vegetarian (well, lacto-ovo vegetarian) in my eating. Most of the time, meat for me is no longer the center of the meal, it's just the side dish, the flavoring. The meat I do like is things like the plate pictured above, which is called a Walliserplatte or Walliserteller. You have a plate of this type in many European countries - it's an assortment of hams, sausages and other cold cuts, artfully arranged, often served with something sour like pickles or cornichons, and of course some good, crusty bread and wine. 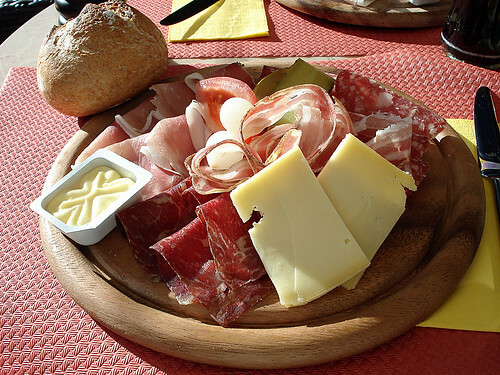 This particular plate, which has all kinds of traditional Swiss cured meats, is simple and delicious. Although the meats cover the whole plate, the slices are so paper-thin there's probably only about 100-150 grams (4-5 ounces) in total. I also love good sausages (Switzerland has great sausages), or a great, well aged steak (mm...for that I try to wait until I'm in New York, and if I'm feeling brave enough, splurge on steaks from Lobel's). The unfortunate thing is that most of the meat that is affordable on a daily basis seems to have various consequences. One of those, at least for me, is cost. Except for chicken and ground beef, meat here in Switzerland is very expensive. But cost is actually the least of my concerns. Meat, in general, is higher in calories and not-good fat than vegetable proteins. And you know - most run of the mill meat just doesn't taste that good to me. Meat is dull in color when cooked and just not so exciting. I could (and have here) write pages and pages about the delights of fresh vegetables and fruit, but what can you say about a pork chop? Not much really. I used to this this non-meat centric kind of eating came from my cultural heritage - most traditional Japanese food is not meat-centered. (Things like sukiyaki, shabu-shabu and gyuudon (beef bowl) only came into existence after the Meiji Restoration in the 19th Century.) But I see people around me eating like this more and more too. I think it's the modern way to eat. It just dawned on me that it's odd to be talking about this a week before the biggest meat-centric meal of the year in the U.S. I wonder when we will stop having a Big Meat Dish as the centerpiece of a feast? Submitted by maki on 2006-11-17 09:27. Meat as a side dish is an awesome way to describe it. People often think I'm a vegetarian too, but it's more that if I'm going to eat meat, I want it to be good meat. I would be fine going without meat for weeks at a time, but then sometimes I want a steak or a hamburger or pork chops or something. I think this started in the college dining hall, when the only meat that looked remotely appetizing was chicken strips, so I would be a veggie-and-chicken-strips-etarian for months, then when I went home to visit my parents, I would beg them to take me out for a good steak dinner. I don't really like cooking meat that much, so I'll often cook vegetarian dishes for myself then use eating out as an opportunity to let someone else do the meat-cooking for me. I absolutely agree with thinking of meat as a side-dish. I was a vegetarian for many years. I think it was a reaction to Chilean food (where I grew up), which is very meat-centric. I relaxed my vegetarianism when I moved to Japan, and found that most Japanese food (not all) uses small amounts of meat and fish, but it doesn't dominate the meal--you still have several vegetable dishes and rice. When I invite people over for dinner, I've often been told that it was weird/unexpected not to find a lot of meat, but to still get a bit of its flavour. I'm all for meat as a side-dish! I know I could never be a vegetarian because I love the taste of meat so much. I do think I eat less than I used to. I even eat foie gras now but have troule with what they call saucisson here in France-rather greasy and you aren't sure what its made of. I do love Chinese food which, come to think of it, just has a little bit of meat in the meat dishes-it gives it a great flavor. srah, you hit the nail on the head. If I'm going to eat meat I want it to be good! I love good meat dishes - besides steak and things I love things like roast chicken or even spare ribs, but I hate it when they get those things wrong - dried out chicken, too-sweet and mediocre ribs..ugh! It's just too bad that 'everyday' meat tends to be so mediocre, but then I guess that has a good effect in that it makes vegetables and other things taste so much better in comparison. Nico and Linda you're right, a lot of Asian cuisines use meat as flavoring, which is really a great way to go. Prac, I think the taste/smell you are talking about is what in Japanese is called 'kusami' or 'kuse' - I don't know what the equivalent term would be in English but it's a certain muskiness, or game-iness, that all meats seem to have to some extent. Things like game birds (pheasant, grouse), aged meat, and so on tend to have it more. It appeals to some people but not to others. In Japanese and Chinese (well Cantonese anyway) cooking, more often than not certain ingredients are added to a dish to lessen that 'kuse' as much as possible with aromatic ingredients - onion (or green onion), ginger and garlic in particular. A classic and very simple wonton filling for example is ground pork that's flavored with water in which spring onions and a bit of garlic have been soaked for a few minutes - the flavor of that water alone can lessen the 'kuse' of pork. Alcohol can do it too to an extent. So, you may enjoy meat prepared by Chinese cooks a bit more, if you decide to try it again. Ah, that makes sense, thanks, Maki. Why not switch over to Vegetarian Meat? For the ones who do not want to live without the taste of meat, why not try vegetarian meat? Like tofu, tempeh, soya-meat (tvp), quorn or seitan? Check out recommendable brands at FutureFood. Concerning quality, vegetarian meat is really improving fast, and I hope within a few years it will gain much more popularity. I'm pretty much 75% vegetarian as well! For a family of 4 (minus 1 though, who is 100% vegetarian xP), I use about 1/2 lb. of meat for dinner, sometimes less. I really like using only a little amount of meat, and having the rice and vegetables as the main dishes. It's been like that since I've started taking over the cooking from my mom xD (which was 2 years ago), since my 'specialty' is Asian cuisine. I think you may need to rethink. Flavorful meat such charcuterie or Italian smoked meat are worst kind of meat you can have unless you have a good butcher and you know exactly how they prepare it, and where the meat come from. I think it's best to eat organic/non-medicated meat. fortunately I can get that here. hi! i found your site by searching on Google for "meat as side dish." although you talk a lot about meat being a side dish, unless i missed something, you didn't give any examples of it. could you please offer some suggestions of meat as a side dish? thanks! I really meant that in general, we eat a lot less meat; meat-centric meals (e.g. roast chicken) maybe once a week, twice at the most. The rest of the time we eat a vegetarian meal or food where meat is a flavoring. Examples of that would be stir-fries (mostly vegetable, just a little meat), salads with a little meat, soups and stews and curries where there are far more vegetables than meat. I love meat, I wouldn't trade it for anything, but that's just because I usually eat fish and vegetables, or pasta and stuff with very little meat. Not because we don't have that here at home, because we do, I just find myself having alot of meat leftovers on the plate and my body feels weaker and tells me to eat only my veggies. I'd say that, in a month, 1 week is meat based PLUS stuff with small meat portions (like those pastas I told you about). And even when I eat meat, it's 1/3 meat, 2/3 rice or spaguetti or whatever on the plate, then the soup and the salad. fish I would eat like 2 weeks but the same proportion as the meat. But my body being this picky actually makes me happy, when people see me eating they tell me I'm all smiley and excited, and that's because I appreciate all the food and it tastes so much better, not eating too much or too little of anything. I started when I felt very sleepy and tired and decided to change the way I ate, so I decided to have a non mediterranian diet for a while and tried asian food, that's also when I found out about your sites. So thank you for the wonderful recipes and tips, when I try them I always feel inspired to create other-somethings sometimes a little more fitted to my taste (ok, I am food picky =X). I a vegetarian and do all the cooking at home (mostly vegan as my wife doesn't eat dairy), occasionally cooking some free range chicken for my wife or guests. Yes, quality is where it's at and not quantity. Here's in Ireland as well as most of the "western" world, people eat far too much meat and not much of anything else. That is very evident is see what people leave on their plates when eating out - the salad and the vegetables ! The demand for cheap food has equated to cheap meat. Lots of good quality local (organic if possible) fruit and vegetables are vital in anyone's diet, vegetarian or not. The vitality of fresh produce is so important for our health and our enjoyment of food. Maki, your site is brilliant full of really good ideas and advice. Here are two of my other infulences from Ireland - Blazing Salads Cookbook and Paradiso Seasons. Keep up the good work ! I find that at university I eat very little meat. I probably have it once to three times a week if you count fish, and then in small servings. At home if we had lamb chops there would be 2 each and some going spare. Here I buy small ones and only eat one per meal. A tin of tuna makes a pasta bake for 6 meals which I freeze. I still have 1/4 of the haggis I bought last term in the freezer. By preference I would rather have high quality meat in small amounts occasionally than low quality stuff all the time. Also, I don't really have the stomache for all that protein. To me, meat is to a meal as jam is to bread. It's nice, but you wouldn't eat it with a spoon on it's own or spread it on an inch thinck, and sometimes you'd much rather put on lemon curd or butter.